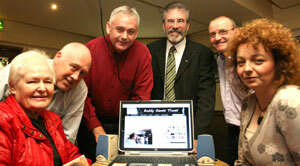 ADDRESSING the many republicans from across Belfast who gathered in the Felons’ Club last Friday, 7 November, for the launch of the Bobby Sands Trust website, Sinn Féin President Gerry Adams praised the work of the members of the trust for their work over the years. Adams in particular mentioned republicans such as Tom Hartley, who diligently preserved artefacts from the time of the prison struggle through the 1970s and 1980s which provide much of the information for the Sands Trust archive. Adams rightly identified that the work done by the Bobby Sands Trust which deals with the prison struggles in Armagh and in the H-Blocks of Long Kesh “is hugely important and significant”. “Due to the diligent work of some republican activists at that time, material was kept and archives were developed. “With the modernisation of the website, which gets tens of thousands of hits, those who want information now have access to a well-researched primary source. The Bobby Sands Trust was formed after the 1981 Hunger Strike when ten republican prisoners died to reassert the political status which had been withdrawn by the British Government and its repressive prison regime. Twenty-seven-year-old Bobby Sands, after enduring years of solitary confinement and beatings, led that hunger strike, during which he was elected as MP for the constituency of Fermanagh/South Tyrone. He died on 5 May 1981, after 66 days on hunger strike. During his imprisonment, Bobby wrote poetry, short stories, a poignant account of what the prisoners suffered (One Day in My Life), and kept a diary for the first 17 days of his hunger strike. The trust is made up of comrades of Bobby and his republican contemporaries. The civil rights lawyer, Pat Finucane, an advisor to the trust, was assassinated in 1989 by loyalist paramilitaries who were under the control of British Intelligence through their agent Brian Nelson. The legal firm Madden & Finucane continues to act for the trust, whose original members were Gerry Adams, Danny Morrison, Tom Hartley, the late Tom Cahill, Marie Moore and Danny Devenny. For a time, Bobby’s two sisters, Marcella and Bernadette, were members of the trust. Current members are Gerry Adams MP, Danny Morrison, Tom Hartley, Jim Gibney, Brendan ‘Bik’ McFarlane, Sile Darragh, Carál Ní Chuilín MLA, and Peter Madden. The trust holds the copyright on all Bobby’s poetry and prose and was established to publish, promote and keep in print the extraordinary writings of this young Irishman, who from prison isolation became an international figure in 1981 and who, to this day, continues to inspire Irish republicans in their pursuit of freedom from British rule.